Actress Barbara Billingsley—who became one of the most iconic mother figures America has ever had playing June Cleaver on Leave It To Beaver—died over the weekend. She was 94. Before Leave It To Beaver, Billingsley was a model and MGM contract player who had several small, mostly uncredited roles in films throughout the 1940s and 1950s. She broke into television in the early ‘50s with appearances on early programs like The Abbot And Costello Show and Make Room For Daddy, the latter of which almost cast her as the second wife to Danny Thomas’ widower. Although she lost the part, in 1957 she landed the much more iconic role of the loving matriarch of the Cleaver family—who always looked impeccable in pearls and high heels, even while vacuuming or preparing a roast—a part that she would play until the show’s end in 1963. Billingsley was the ideal TV mom, always waiting with a kind word and a plate of cookies—an archetypal spin on the nuclear family that Billingsley, a working single mother herself, often acknowledged was a total fantasy. 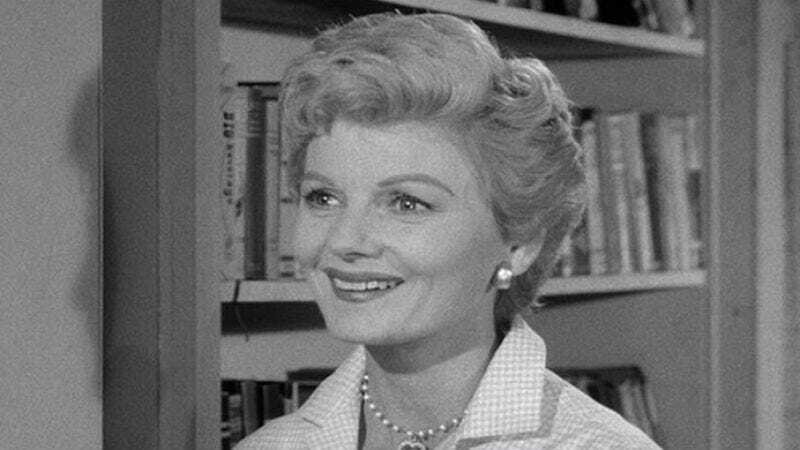 Billingsley would return to the role of June Cleaver again—in the 1983 TV movie Still The Beaver and then the 1985 series The New Leave It To Beaver (while turning up as “Aunt Martha” in the 1997 big-screen version), as well as playing the character in the “Remote Control Man” episode of Amazing Stories, on the short-lived 1988 sitcom Baby Boom, and as the leader of a posse of fellow TV moms on Roseanne—but less directly, the character would define the rest of her career. After having trouble getting work during the years immediately following Beaver’s cancellation, Billingsley eventually found a way to get back at the typecasting that dogged her: She spoofed the hell out of it with a memorable cameo in 1980’s Airplane, playing a passenger who happens to speak jive. That cameo led to a slight career resurgence that contributed to Billingsley playing a mother figure to a whole new generation, as the voice of Nanny on The Muppet Babies. Billingsley’s voice—soothing and full of gently scolding tough love—filled the screen, although her character is only seen as a pair of striped socks. In her later years, Billingsley also turned up on shows like Parker Lewis Can’t Lose, Murphy Brown, and Empty Nest, always with a nod to her role as America’s most trusted TV mom.